To begin using hopTo your IT administrator will need to install the hopTo Work Agent on your RDS enabled Windows Server. hopTo Work comes with a full-featured Sample User app that lets you preview the elegant workspace and all of its features—with the exception of adding cloud sources—before having to set up a Windows Host. 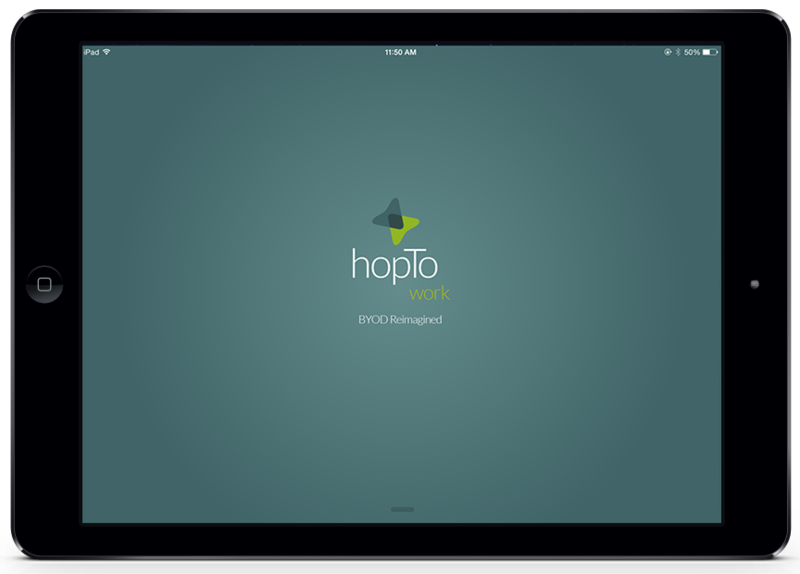 Take a quick tour of hopTo Work by trying the Sample User app! 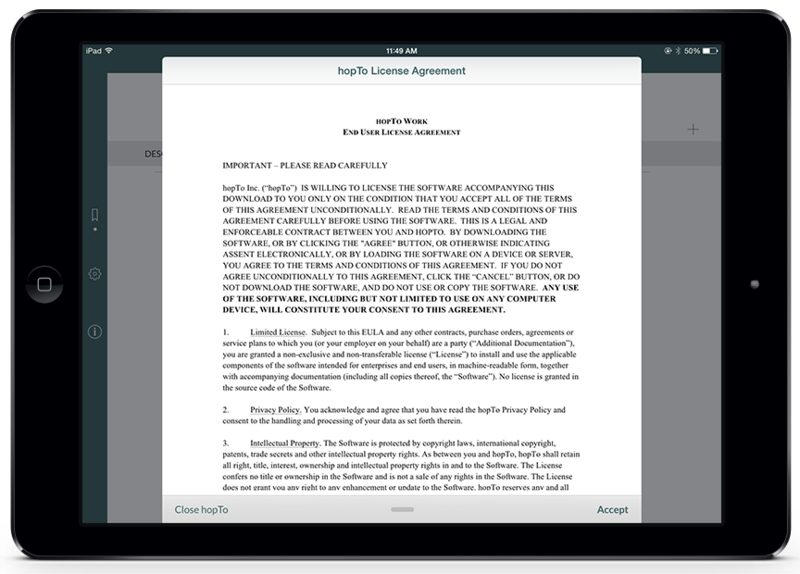 When you tap the hopTo Work icon on your device to open the app, the first screen that appears is the license agreement. Please read the agreement and tap Accept to continue. The hopTo Hosts screen appears with the Sample Host in place. The Sample Host lets you get a feel for the workspace and the hopTo Work functions with have to set up a Windows Host. To see complete descriptions and step-by-step instructions of all the hopTo Work features and functions see the Workspace of this knowledge article below. If you choose to skip the Sample Host and want to set up your Windows Host, please go to the section below called "Adding a Host". To start the Sample Host, simply touch the Sample Host line. Once you are ready to set up your Windows Host, make sure that you have network, VPN or Gateway access to your server in order to run the hopTo Work application. The steps for adding a Host with or without a gateway address are in the following screens. 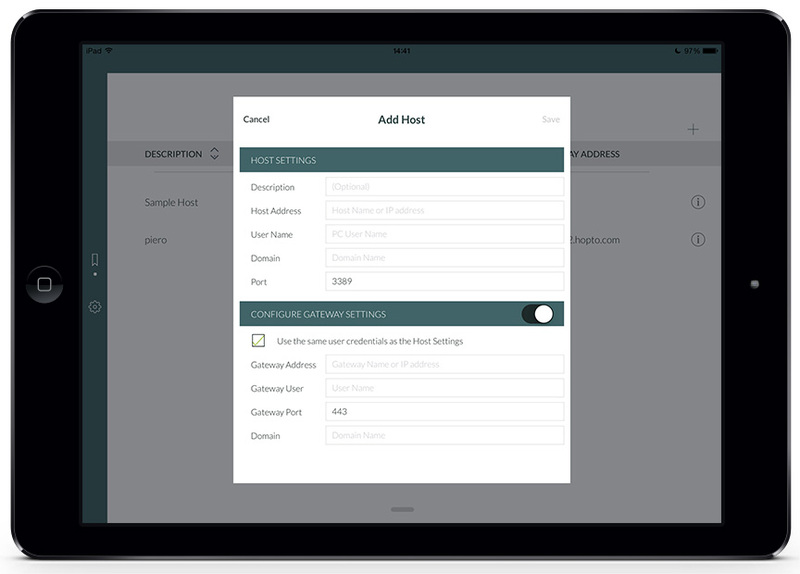 To add the host, tap the Add Host button. The Add Host dialog appears. A description (optional) to identify the host. The host address (for example, abc-ad1.yourcompanydomain.com). The user name (for example, Jane Doe). In the Add Host dialog, enter the information in the Host Settings as in the above example, and then tap the Configure Gateway Settings tab to turn on the setting. The dialog expands to display the Gateway settings. Check the “Use the same user credentials as the Host Settings” check box. Enter the Gateway address (for example, abc-gw.yourcompanydomain.com). You’ll see that the Gateway User and Domain are automatically entered. Once you have saved the Add Host settings, you’ll see your hopTo Hosts listed on the screen. Tap the host address to connect hopTo Work to your host. The hopTo Host Credentials dialog appears. If you added a host without a gateway, the dialog looks like this and you just need to enter your password and tap Connect in the upper right corner of the dialog. If you added a host with a gateway configuration, the screen looks like this. You’ll see that hopTo Work is connecting to the host address, and then the home page will appear. Please note that if this is the first time you’re connecting remotely, the connection will take slightly longer than usual to connect to your host. The home page appears with the All Files tab open, which displays all your folders and files in your home directory on the Windows system and your connected Cloud sources. For instructions on how to connect your Cloud sources, see the Settings section. Note: The vertical left panel can be collapsed and expanded by swiping it left and right. The vertical panel and horizontal bar are described in the following sections. The Main Menu organizes and displays your files and folders in tabs that correspond to the function; for example, files you’ve saved as favorites, files you’ve recently accessed, shared files on SharePoint, or all your files in your home directory. It also displays available remote applications, and any connected Cloud sources. The following sections describe each function in the panel. 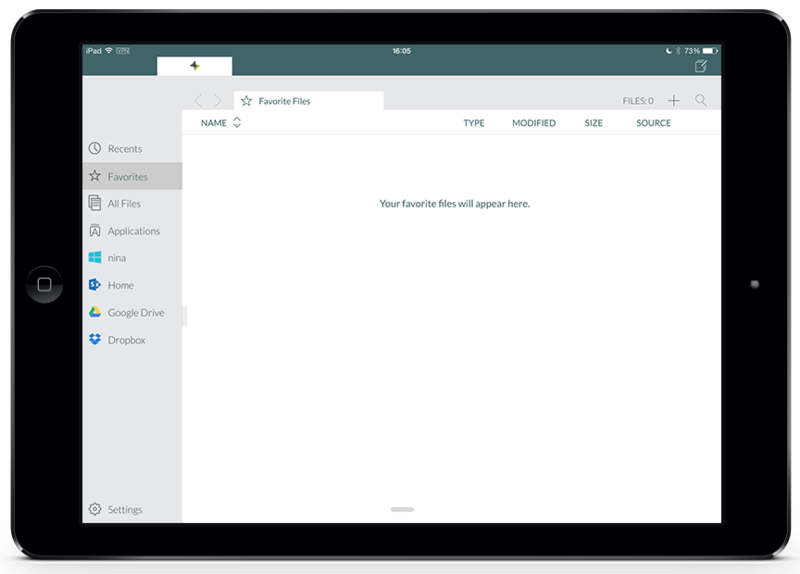 Displays the files you have saved as favorites. Displays all your files in your home directory and the Cloud services in which they’re stored. Displays the remote applications available to you from your Windows server. 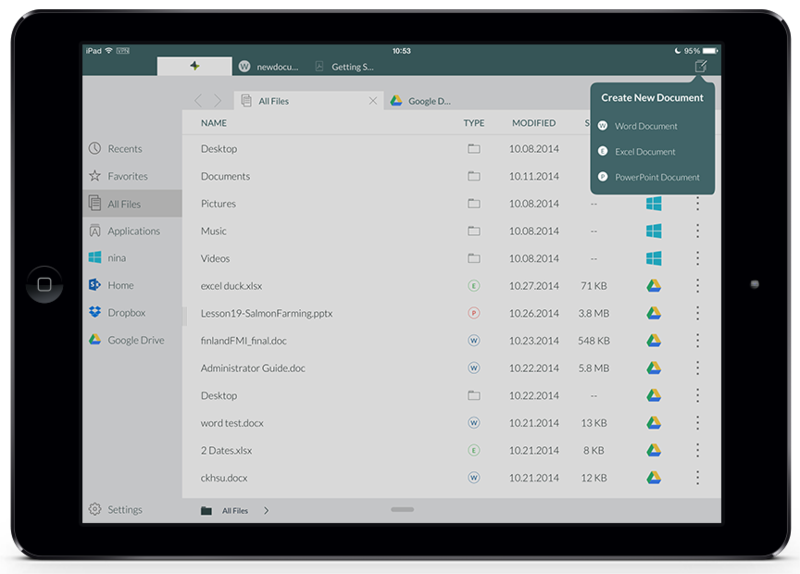 Displays your shared documents on SharePoint. Displays your documents on a mapped drive. 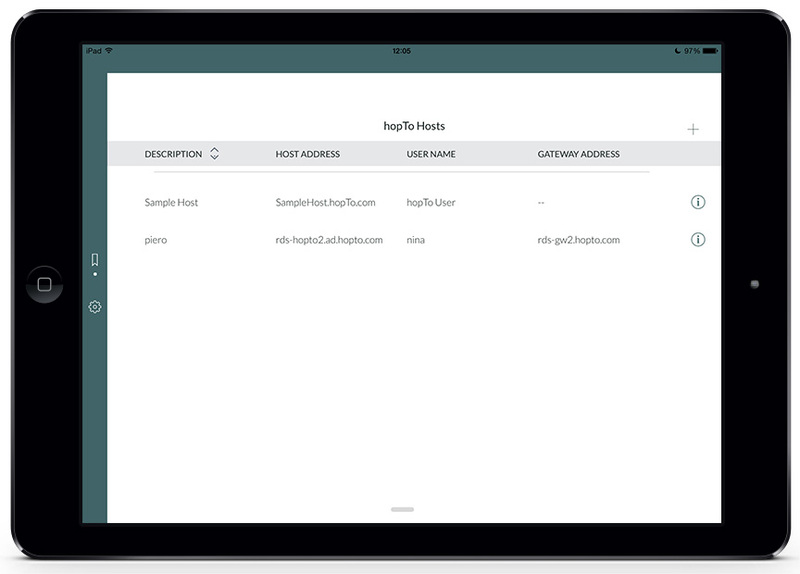 Displays your connected Cloud Services and shows which user is logged in. 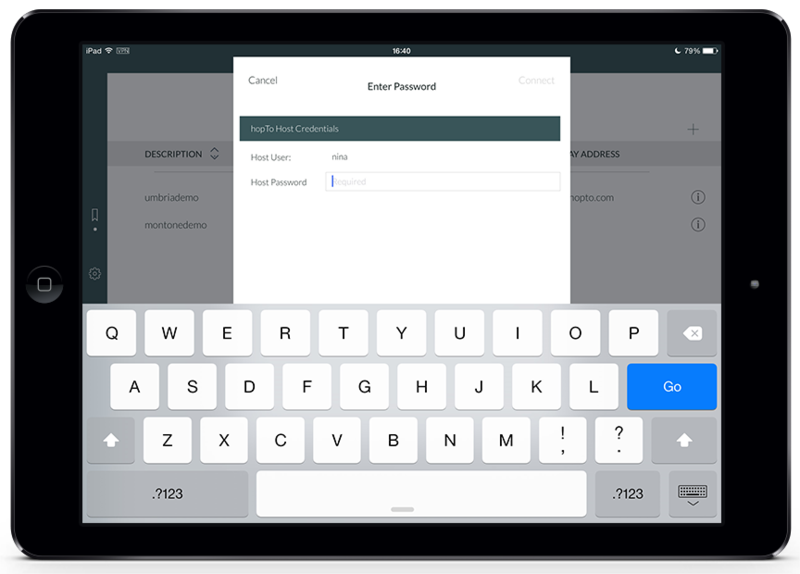 This screen also includes a Tutorial button and a Logout button. To connect your Cloud sources, tap a source and log in with your user credentials. The dark horizontal bar across the top displays the hopTo Work home page icon and the Create New Document icon on the far right. These two functions are described in the Create New Document section. The gray horizontal bar displays navigation arrows, any open tabs, the “+” symbol for adding a new tab, and the search symbol. Tap the “+” symbol at the upper right of the gray bar. A new home page tab appears (All Files). To display a different view (for example, Recents) in the new tab, simply tap Favorites in the left panel and the tab changes to Favorites. You can have up to four tabs open at once. To close a tab, tap the X symbol. 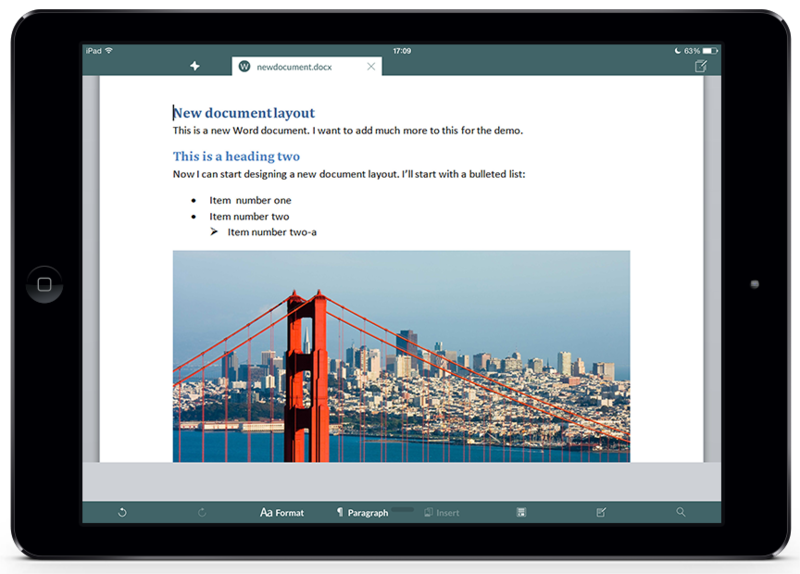 Tap the Create New Document icon to display the dropdown list, which includes creating new Word, Excel, and PowerPoint Documents. When you create a new Word document, the untitled document tab appears in the top horizontal bar. 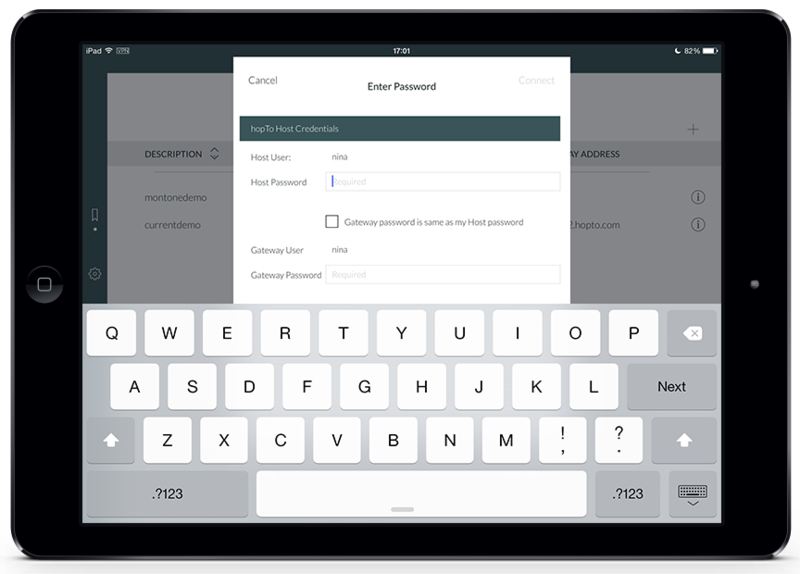 Simply tab the screen anywhere to bring up the keyboard and start typing in your new document. The rich formatting features that you’re used to with Word are right at your fingertips. You can work with fonts, headings, paragraph settings, and lists. 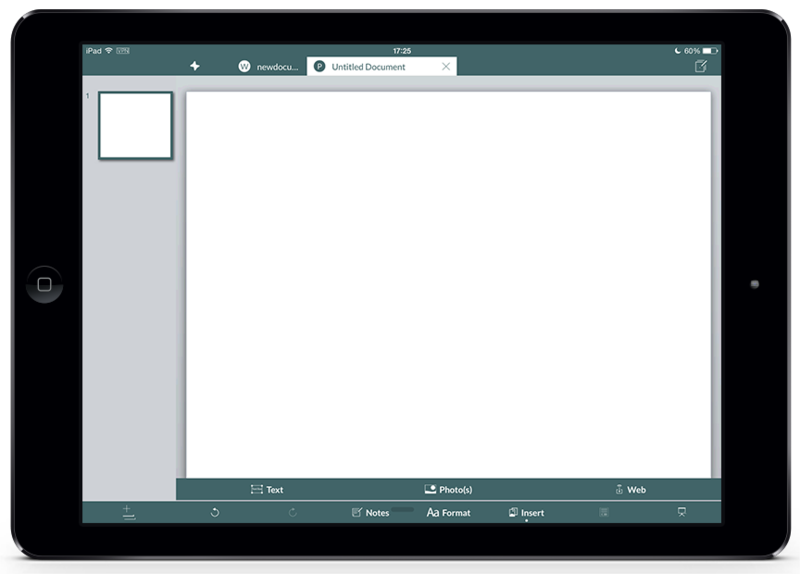 The navigation panel at the left displays the document layout in various formats. At any time, you can save your work with the Save button. You can also track changes, an essential feature for productivity and collaboration with colleagues. It’s easy to insert photos and tables. You can import photos from your photo library or directly from the Web using Google Image Search. Tap Insert, then tap Web. Enter a word in the search area, for example San Francisco, and photos of San Francisco will appear. The next screen shows the results of our San Francisco search. And here is our beautiful photo of San Francisco inserted into our document. hopTo Work gives you two context-aware keyboards for working with Excel spreadsheets: alphabetic for text and a numeric keypad for cells that contain numbers. This is the alphabetic keyboard. At any time, you can save your work with the Save button. 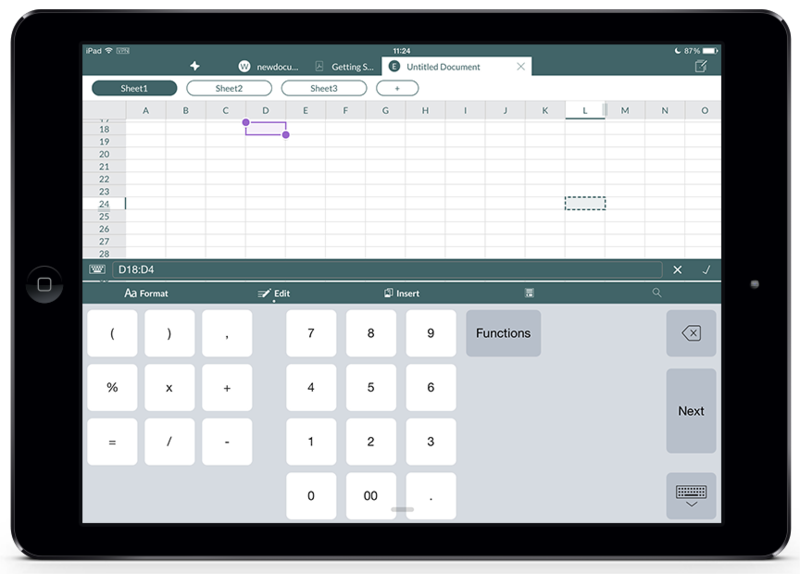 This screen shows the numeric keypad and functions. 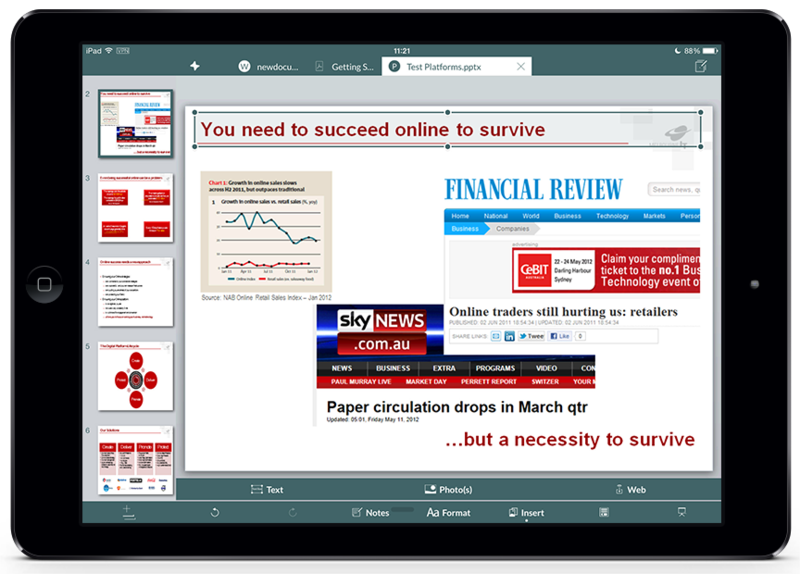 The editing features let you work with existing PPT presentations for whatever changes you may need while on the go. You can toggle between the hopTo Work home page icon and your open document. When you tap the home page icon, all your files appear on the screen and your document remains open in its tab. Once you save your document, you’ll see it listed in your Documents folder in your home directory on your Windows system. Your new document will also be listed in your Recent Files. 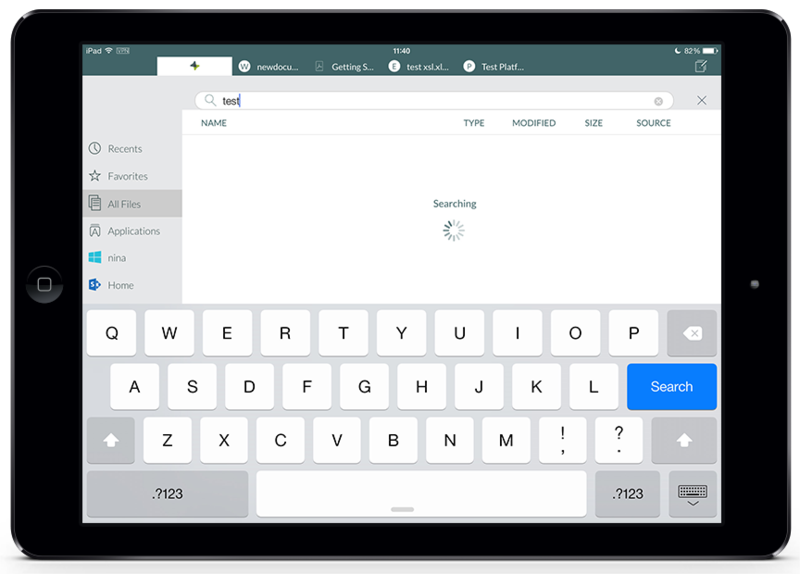 Tap the search symbol in the upper right of the tab bar. The Search bar appears in place of the tabs. Start typing any word and the search function begins immediately. Your search results appear with all the sources of the files with the word “test” in them.